Tons of great stuff has been happening behind the scenes in anticipation of shipment and I wanted to give you a quick heads up since I’m seeing more questions in support about this - we’re getting all the loose ends tied together to get Bolt out the door and we’re preparing an email that will let you select the finish of Bolt. If you were in line for Bolt Preview but we didn’t get to you, you will be able to choose between both Bolt and Bolt Preview finishes. We’ll also be detailing how we’re ordering the shipments. Apologies it’s taking a little while, we need to take some technical resources off of Lockitron Bolt to get this email prepared. Lastly, if you’re a crowdfunded Lockitron backer and have not placed your migration order, please send us an email and we’ll help to get you set up with your migration order. UPDATE: although we’re working through some rendering issues (sorry for the teensy menus), you should now be able to select your Lockitron finish. EMAIL SENT! 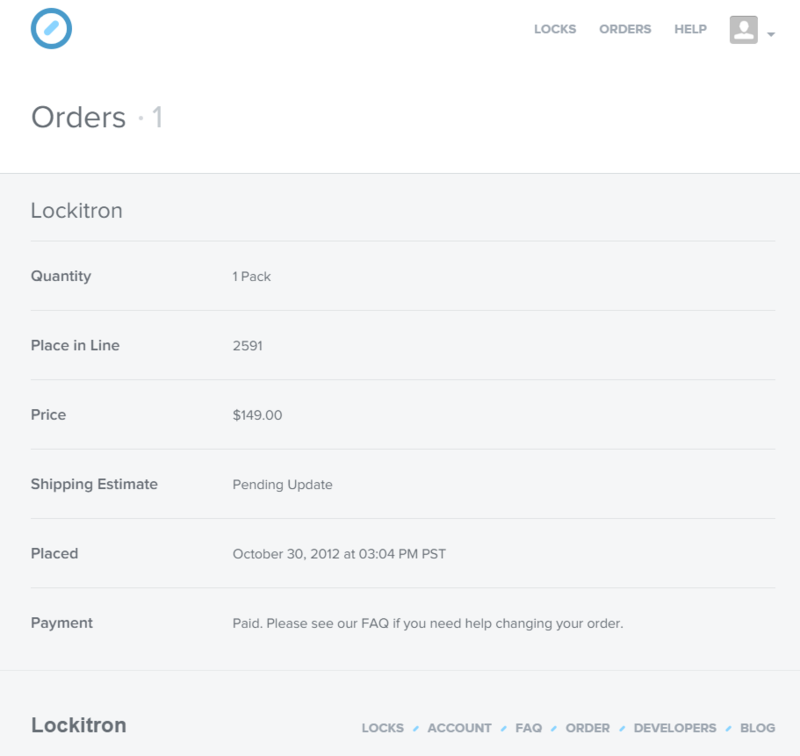 Head to the dashboard (https://lockitron.com/dashboard/orders) and click “Edit” in the Color section. Super excited to get my bolts! One question though… will we be getting bridge with them? Or will that come later? I am not seeing any place to edit my color in the dashboard. My place in line is 2591. @Bob have you placed a migration order? @Jason_Silva email will detail that - first units, no. However, Bridges are in assembly now. @Bob I see it for you - the row is “Color” and the Edit button is on the right. I dont see anything for color, or edit. @Bob under the email address associated with your account here? It does look like I had a different email address that I originally purchased it with. I was able to enter a color when using the updated email address. Hopefully I didn’t lose my place in line. I didnt see any place in line with the new email login. Once you pick a color is there an amount of time you have to change it before its final? @Beavis97 we would like the colors locked in as soon as possible. Essentially we want everything - color choice & address - set up in the next couple of weeks for all backers. @cameron I don’t know if its saving my color choice or not because when I pull it back up its blank again. can you confirm? @Beavis97 hmm - what color are you trying to choose and were you a crowdfunded backer or did you pre-order this year? @Beavis97 Satin Nickel or Quicksilver? @cameron only 2 choices I have are the quicksilver and modern gold. @Beavis97 yes, there is a bug. Looking into it now. @Beavis97 this should be all patched up now! @cameron I see. Thank you very much. I look forward to finally being able to use my lockitron. Are there any updated pics of the bridge and it is ready to ship as well? Also any more info on key match?